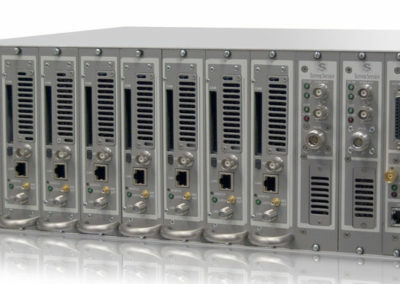 – Multi Input (ASI+ SAT) Transmitter Seamless Switching. – Gap Filler with echo cancelling. 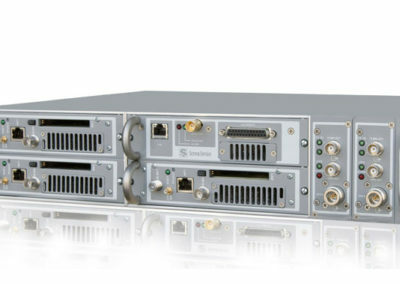 • Multiple RF channels: up to 7 channels can be frequency multiplexed to output. • N+1 redundancy system with up to 7 main devices and 1 reserve. • Full UHF Band, frequency range 470-860Mhz. • Linear and Non Linear adaptive pre-correction with preloaded tables or graphical setting. • GPS plug-in boards (redundancy as option). 1PPS and 10 MHz (for each GPS board). • Redundant power supply (as option).